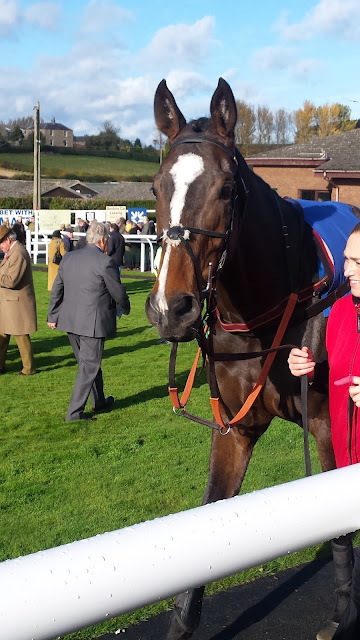 On Saturday 24th October, Smarty and I headed to Kelso for a day at the races. 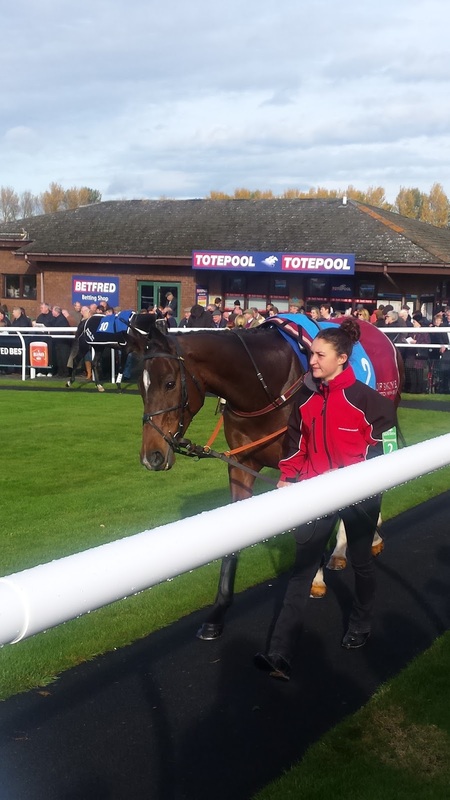 The main purpose for the trip, for me at least, was to see two of my five to follow from Lucinda's open day who were scheduled to run in the first two races. Having never been to Kelso Racecourse before, I was pleasantly surprised by what Smarty refers to as 'the quaintest racetrack in Britain'. And he's right, it really is quaint. It feels like the mixture of a much larger racecourse with a point to point track. Everything was sufficiently close together; the betting shop was clearly built some time after the various elements of the course were established and the proximity of the rail to the racetrack itself was such that you could almost reach out and touch the horses as they stormed past to the finish line. That has often been my one criticism of Thoroughbred racing and major positive from harness racing - with trotting you can physically lean over the rail - I almost got caught a cracker by Sarah Allen at York towards the back end of the season as she mounted a four-wide late challenge and drew the whip down an inch from my face as I leaned through the crowd to see who was most likely to win. I don't recall ever going racing with the intention of betting a horse regardless of its price, the other runners or the way it looks - it goes against my nature - and the only time I've ever done anything similar was when at Cheltenham as a child to watch See More Business race (I didn't get pocket money as a child but when we went racing I was allowed to have a £1 bet on each race - I can't remember the odds that day but I know my dad let me keep all the winnings including the stake, which only happened that once...he normally kept the stake money!). Smarty wanted to wander around, check the form in the betting shop and show me around but I just wanted to stand at the pre-parade ring to wait for Big River to come out. Whilst there I noticed the very hands-on approach that Grand National winning trainer Sue Smith (Auroras Encore, the 100-1 pick of Smarty's and the horse we named our first Crosshill colt after) took with her charge, Just Georgie (and in subsequent races as well). I like to see a trainer preparing a horse for a race, it's encouraging to see them putting the finishing touches in place. Smarty was so impressed with her and the horse that he decided to bet against Big River, who I managed to back at 15-8, who went off as the 13-8 favourite. When he headed to the paddock I followed, just to take photos like the equine-stalker that I am turning into. Once the money was on, I went to stand by the rail whilst Smarty took up his favourite spot in the stands. Whilst there, a couple of guys from Newcastle struck up conversation by asking what I'd backed. When I said Big River, the reply I received was 'ah, so you've just gone with everybody else?'. That got my back up straight away - working alongside Smarty as a bookmaker is just the most recent scenario in a long line whereby as a female I am not given much respect as a punter or indeed as a bookmaker. I could have let it go, but I decided I'd tell them (briefly) about my trip to Lucinda's yard. That didn't really gain me many brownie points, but when the one guy told me he usually just picks horses based on how they look in the paddock, and how that worked for him, I told him of the last time I closed the racecard and picked a horse purely on how it looked in the paddock. It was New Year's Day at Cheltenham, in a bumper, and the horse I picked won easily, beating the horse John had chosen in the paddock in a two-horse finish in a 16 horse race. That horse was The New One. That put an end to the dominant male routine he'd been putting on. Smarty was confident that between us we would back the winner, and Lucinda did it for the girls when Big River came home just ahead of Just Georgie. Winner number one on the board for me. The two guys shook my hand and asked for a tip in the next: I gave them One For Arthur. The routine for me in race two was the same, except I backed my choice before going to the paddock just to make sure I got a decent price. I was pleased to get 11-2, especially as Smarty decided to bet with my choice but after we'd been to the paddock, and only got 4-1. 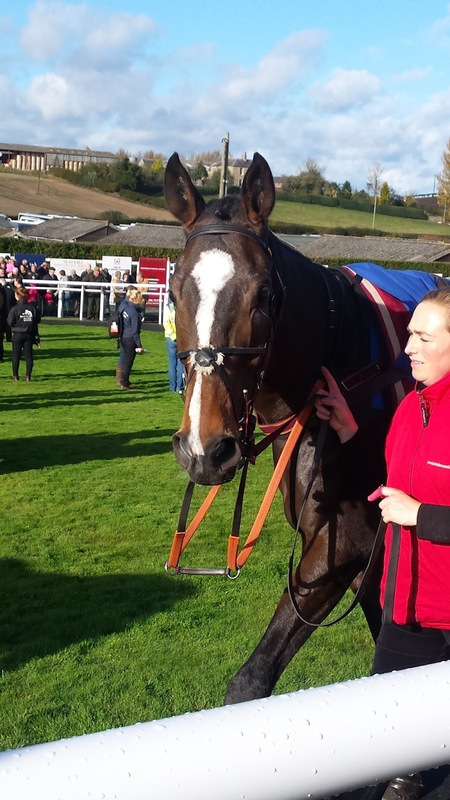 It was a wise move nonetheless, as One For Arthur notched up Lucinda's quickfire double on the day. Mission accomplished for me. I went to bet two horses; I bet them; they won. Job done. After that, it was more of a guessing game. The punters seemed to fancy Lucinda again for a treble, in the way that a gambling mass often do, however I went for another lady trainer in the form of Sue Smith. I couldn't resist her grey gelding Straidnahanna, and he was only a length from securing me three from three when getting beat into second. 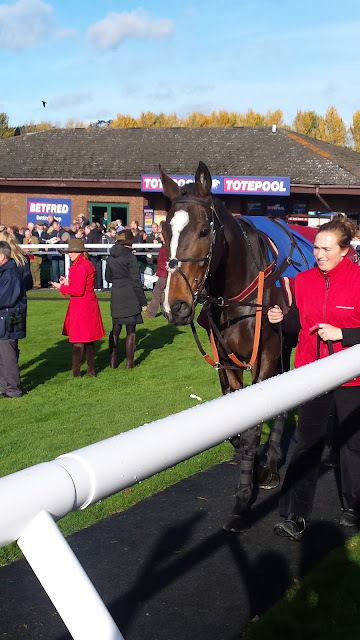 For the fourth, a 12 horse handicap hurdle, I couldn't have the favourite for love nor money after seeing him in the pre-parade ring, so headed to the paddock with a totally blank mind. One horse jumped out for me on looks and condition, even when compared against the entire rest of the field. Smarty and me went to bet her, a mare by the name of Allizee De Janeiro, and surprise surprise, she hailed from the Lucinda Russell yard. We backed her at 17-2, and then as we headed to the side of the track she drifted to 10s so we backed her again. She did not let us down and she rounded off a profitable day for us both. We left after the fourth as we had to be home to sort our own horses out before nightfall, but I can honestly say I had a brilliant day at Kelso. 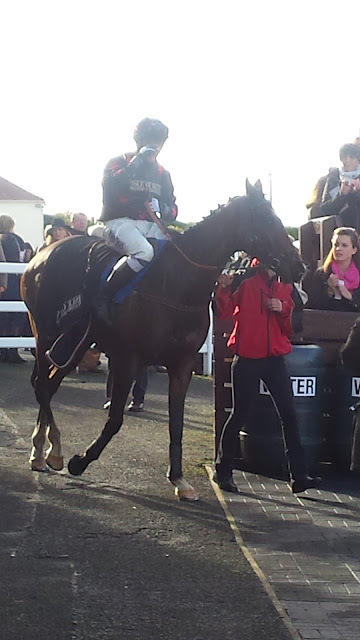 The mare runs again tomorrow at Kelso, this time top weight after winning from bottom weight a couple of weeks ago. She is currently 13-8 favourite and I will be checking the results tomorrow whilst watching the racing from Aintree to see how she fares. 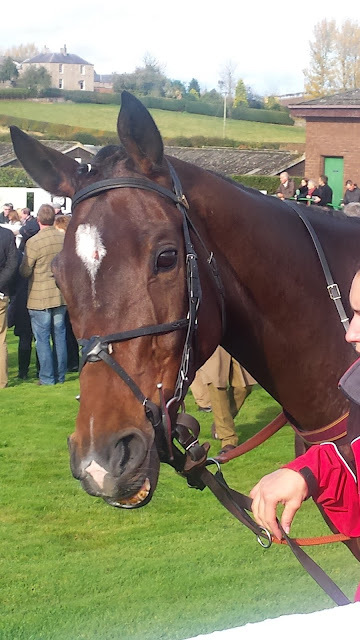 Of my other horses to follow, The Cobbler Swayne won yesterday at Musselburgh as the 15-8 favourite. Rising Tide has yet to race since the open day and Simarthur is yet to run notably however I have faith that he will find his level and reach his potential in the hands that he is in. I have set them all up on an alert tracker, along with a couple of other horses that caught my eye at Kelso, most notably Seldom Inn of Sandy Thomson's and Blakemount of Sue Smith's who finished second and third to One For Arthur respectively.